Tess Cooling Calligraphy01600 713021work ShopTess sees the importance and beauty of words and, combined with her love of art, making words beautiful seemed a natural progression. She produces her original designs on hand milled, heavy weight watercolour paper using richly pigmented inks. She then hand finishes, her limited edition prints on rough textured, deckle-edged paper, and gold or silver leaf. Tess sees the importance and beauty of words and, combined with her love of art, making words beautiful seemed a natural progression. She produces her original designs on hand milled, heavy weight watercolour paper using richly pigmented inks. She then hand finishes, her limited edition prints on rough textured, deckle-edged paper, and gold or silver leaf. Tess’s commissions often commemorate special events. 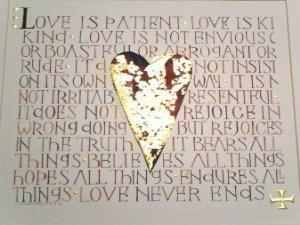 She works with her client’s to create a piece of art using their favourite verse or words of special meaning. Tess derives enormous satisfaction from putting a visual interpretation on words that inspire or comfort people. She enjoys the challenge of researching and gaining contextual understanding of the words and then creating a new work of art. She has produced a piece for the Archbishop of Canterbury, Dr Rowan Williams.